Terry’s Kids Shoes has been a fixture in Midland since 2000 and a presence in West Texas since 1976, but on the day before Easter this year, Terry Severt sized his last shoe and retired from retail after 42 years working in the industry. “It was just time,” Severt said when discussing the difficult decision to step away. The business and the brand, however, continue under new ownership, and they’ve been a great fit. New owners and brother-sister team Chris Cato and Jennifer Doonan took over operations this summer. Cato recently sunset his hot shot company, Cato’s Carriers, after five years in business. 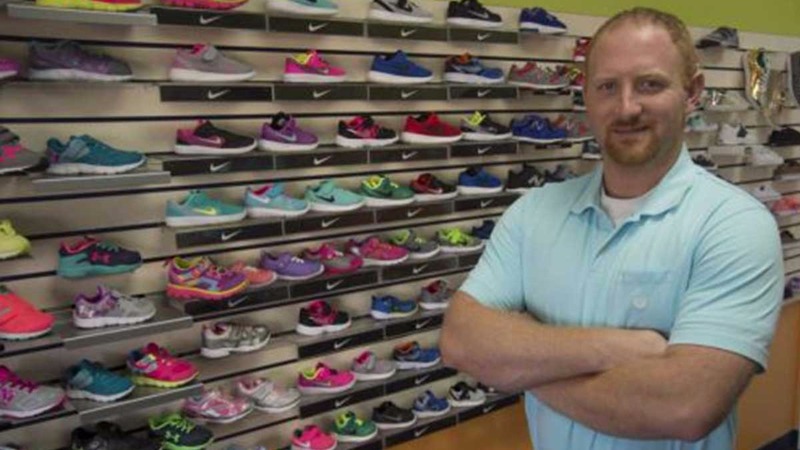 At 25 — the same age Severt was when he started Terry’s — he traded in the often-stressful oilfield transportation life for more relaxed, though still long, days fitting children with the perfect shoes. “This is a much more family-friendly working environment,” he said. Severt said he was on the cusp of a great career with the company, but work got complicated. “When they went on strike, I needed money, so I worked part-time at a children’s shoe store, of all things, and never thought that’s what I would wind up doing. I did that for a year and a half, even after I went back to working at the pharmaceutical company. “After college, I moved to San Angelo with the intent of opening up a store. I enjoyed the work and was young and crazy enough to try it,” he said. Many West Texas children have walked — and run — out of Terry’s with a fresh pair of shoes. Severt estimates he was open about 300 days per year for 40 years and sold about 30 pairs per day. That’s 360,000 pairs shoes, though Severt said it seems like he has sold millions. Terry’s remedies too-small or too-narrow feet with inserts to get the right fit, and Severt has worked extensively with Cato to teach the father of two young daughters the craft of getting the perfect fit. “It’s been remarkable what he’s done. He’s caught on to a lot of things, and there’s a lot to it,” said Severt, who closed the San Angelo store a year after opening the Midland location. Having several children, grandchildren and extended family, Scott was a major customer at Terry’s. She estimates she has purchased hundreds of shoes there. Cato said the space, located next to Home Goods at 3001 Loop 250 Suite C-119, took $20,000 to renovate and included new paint, new carpeting and HVAC work. It’s brightly colored with room to run so kids can test their shoes. “They have to make sure their shoes make them faster,” Cato said. The carpet-covered benches Severt constructed are still a fixture. “Kids automatically think it’s a playground,” Scott said. The remodel also includes touches that aren’t visible to patrons. “We are all Christians, and behind all of this green and orange paint are Scriptures written on the walls,” Scott said. Cato replaced Severt’s paper-based management methods with modern computer-driven retail and point-of-sale systems. Terry’s offers a wide selection children’s shoes, dance gear, cleats, bags and accessories, and being able to find all of that in one place is valuable to Midland. small selection and you have to go store-to-store,” Cato said.